Digitally Remastered Version of his Classic 1975 Release.produced By George Martin. I bought the vinyl when it was first on sale ! Loved it so much I had to have it in my collection of really great instrumental guitar collections. Jeff Beck has always been one of Rocks premiere guitarists. This is Becks' first solo instrumental album. It was produced by George Martin. On this CD you will find a very stong version of the Beatles classic, She's A Woman. Cause We Ended As Lovers is another very strong effort and it has almost a blues feel to it. Freeway Jam also appears on this album and is one of his finest instrumental songs ever. Diamond Dust ends the CD on a very strong note. Blow By Blow has been among my top 10 guitar albums since its original vinyl release, and yes I have purchased a copy in each of its incarnations (including the Mobile Fidelity release). I didn't think it could get much better than that, but thanks to advances in digital mastering technology, the 2001 remaster does offer noticable improvements. The separation of different instruments seems more pronounced, and the increase in the overall levels causes the music to virtually leap from the speakers. I wish all remasters delivered the satisfaction that this does (for me anyway). A masterpiece, pure and simple! This CD blew me away 25 years ago, and still does today. Despite the number of 'guitar heroes' (whom all of which I admire very much) out there, 'Blow by Blow' was THE one to get the guitar-rock-fusion thing going. This special album has survived the test of time and mainly for four songs: Scatterbrain, Cause We've Survived As Lovers, Freeway Jam, and Diamond Dust. The word above and similar ( e.g. trendsetting, awesome!) has been overused and wasted on artists who lack inspiration/imagination. For me Jeff Beck is as instantly identifiable as Django Reinhardt. (i understand that Reinhardt was one of Jeffs heroes)There are lots of things that he infact shares with Django e.g. his total nonchalance towards formal musical theory, which in itself makes him fearless and without boundaries.He knows of NO restrictions but also doesn't take his talent too seriously. Another thing he shares is his incredibly good ear for music and his complete unpredictability. This is a rare aspect. I don't know of anyone else in the rock idiom who can accomplish this...not even Hendrix could go from pure tone to mid range to fuzz to reverb all on one song ( listen to "She's A Woman"). It's also like a painter using different textures and colours to create a masterpiece.In the early days Les Paul was the only other person to colour his songs with various tones but Jeff has taken it much further. Personally i didn't know a Strat, Tele or Les Paul could acheive so many different sounds and nuances but Jeff can go from screaming psychosis to lyrically poignant beauty all in the space of seconds. ("Constipated Duck" is another example). "Freeway Jam" became Jeffs anthem and Stevie Wonders song to Syreeta " Because We've Ended As Lovers" is very popular from this c.d. There was one tune from this record that i skipped the stylus past when i was a youngster back in 1974 and that was the last track "Diamond Dust". I preferred to hear Jeff tear down walls with feedback. Today, as i'm alot older, this song is my all time favourite of Jeffs. It has to be one of the most haunting and mesmerizing songs ever written.Almost from another Planet. The chords cycle is augmented and obtuse ..sort of unresolved in a Stravinsky/George Russell fashion evoking the vision of a real diamond dust sheen across the Austrian Alps. The timing seems to be 6/8 and the song is so complicated harmonically that it would make Thelonius Monk shudder. If you are looking for the all time best guitar c.d please don't look any further. But also if you are a drummer you'd be astonished to know that the guy for this session was only 18 yrs old at the time (Richard Bailey). His overall contribution to this classic album is beyond words. Pure Virtuosity From the Best Ever! From 'Hi Ho Silver Lining' to this?! Magnificent! I first heard this album 24 years ago, after I left school with a pile of tapes made for me by a friend. I knew it had a strong reputation with the school cognoscenti, and yet I still virtually ignored it. I blame my crummy cassette deck. Listening now in 2001 to the gloriously re-mastered CD, I realise what a treat I've been missing. Jeff Beck has always been much better appreciated in the States than in his home country. In the UK, we know him largely for the 60's nostalgia singalong single, 'Hi Ho Silver Lining'. Play that next to BLOW BY BLOW and you can only conclude that either his has been a hugely under-acknowledged talent or he has been the master of reinventing himself. Here he suddenly invades jazz-rock territory and asserts an immediate claim to the crown. There are touches of Return to Forever's Al diMeola, but the benchmark album for Beck's sound here is Larry Coryell on Eleventh House's LEVEL ONE, a remarkable LP which has never been reissued on CD. Beck is first and foremost an instrumentalist rather than a composer. Having decided on Beatles producer George Martin for this solo LP, it was no great surprise that he should end up doing a Lennon/McCartney number as well as a couple of Stevie Wonder songs. The band throughout is Beck on guitars, Richard Bailey (not Billy Cobham) on drums, Phil Chenn on bass, and the amazingly versatile Max Middleton on keyboards -- he was also a linchpin on John Martyn's GLORIOUS FOOL and Chris Rea's ON THE BEACH, for example. My favourite tracks are the two Wonder songs, 'Thelonius' and the soulful 'Cause We've Ended as Lovers', but the band's playing is outstanding throughout. It's extraordinary that they existed for this one LP. How can anyone rate this album any lower than 5 stars? This is one of Jeff Beck's finest albums. Although you probably already know that. If Jeff Beck was lucky enough to be a Dog, he'd probably be a Whippet: fast, intelligent, dangerous, and highly strung. Blow by Blow - The CD is what I remember from the past, which is what I was wanting. After listening to the CD, I realized that I used to LOVE the LIVE version of some of these tunes... and so, I bought the Jeff Beck/Jan Hammer LIVE CD. Blow by Blow is a studio recording which I find a little "dry" when compared to the energy of the LIVE CD... But it's still Jeff Beck! There is no other guitarist I can think of that can make the instrument communicate on such a Vocal level as Jeff Beck. On this album - and particularly on "Cause We're Ended as Lovers" - he plays with such soul and depth, phrasing as if his instrument is really breathing and singing for him. As for the rest of the album: George Martin's production (and string arrangement on "Diamond Dust") is sympathetic and always on the right level to carry every part of Jeff and his band's playing. 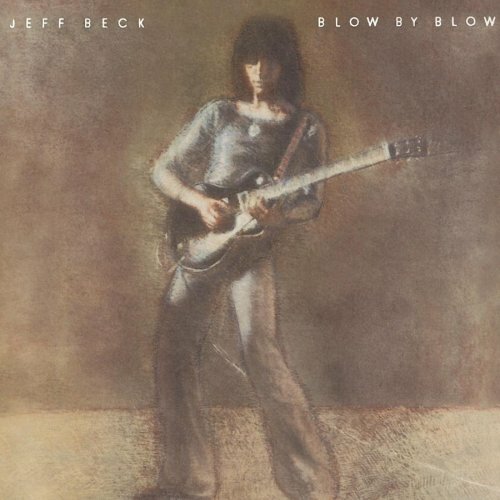 Blow by Blow is, no doubt, one of Jeff Beck's best albums. I also recommend getting You Had It Coming (2001), Wired (1976), and Guitar Shop (1989) for more of Jeff's best. I do not believe there is one bad track on this album. Cause We've Ended as Lovers is obviously the stand out track, but we'll get back to that later. Jeff's cover of She's a Woman is superb, his work with the talkbox is matched by no other guitarist. Too bad Frampton had to go and kill it. A.I.R. Blower and Scatterbrain are also very strong tunes. They contain great melodies, and great solos. Each has a long break in the middle for Jeff to really sing with his guitar. Thelonius is a fun tune, and Freeway Jam is one of my favorite rock tunes, this is classic rock indeed. Diamond Dust contains more of Jeff's emotional playing.